Offers domain name-related services including domain name registration. Domain name directory covering such topics as domain organizations, domain registration registrars, and domain disputes. Offers domain registration, domain transfers, parking, management, name search, name suggestions, and domain information resources. Nearly 1000 domain names for sale, lease, or joint venture. Domain name consulting services also offered. A domain resource directory with such categories as forums, expired domains, and domain tools. Specializes in selling domain names and websites, as well as providing domain registration services. Offers web hosting, domain name registration, domain transfer and website promotion tools. Generates domain names. Combines keywords with a database of popular words. Provides multiple and custom domain name combination and query. Register and park your domain name, comes with free domain and e-mail forwarding. Domain name registration, domain parking, email forwarding and domain manager. A WHOIS domain name search. Check domain name registrations, look up domain names, IP addresses, nameservers, registrars, etc. The latest news on domain disputes, aftermarket sales, new domain extensions, and registrars. Provides domain registration for .com, .net, .org, .info, and .biz domain names. Offers domain name search, registration, and whois services. Buy, sell and lease a domain name. Site offers domain name registration, bulk registrations, and domain name management. Provides domain name registration to the Canadian market and a free search for available domain names. A multilingual domain names registration center providing Chinese, Japanese and Korean domain names. In one of the broadest crackdowns ever issued against a domain name holder, a federal judge orders eReferee.com to stop using the word referee in all of its domain names. By Lisa M. Bowman. A group of Internet top-level domain (TLD) holders have formed a nonprofit association to prevent what they fear will become a splintered Internet domain naming system. Domain hosting and domain registration services. Domain name forum that provides contests, info on various domain topics, and industry news. Domain name registration. Search domain name for availability. Pay by check or credit card. Dedicated service for domain and sub-domain name registration and link/redirect services. Offers domain parking in order to sell the domains of visitors. Domain resource site offering appraisal and sales services. Domain name registration service for individuals and businesses. Providing design and hosting as well as domain registration and search. Daily Domain Counts from all ccTLDs and gTLDs. If the business hours of Internet Connection in may vary on holidays like Valentine’s Day, Washington’s Birthday, St. Patrick’s Day, Easter, Easter eve and Mother’s day. We display standard opening hours and price ranges in our profile site. We recommend to check out icdomainnames.com/ for further information. 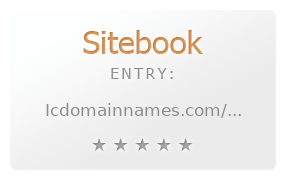 You can also search for Alternatives for icdomainnames.com/ on our Review Site Sitebook.org All trademarks are the property of their respective owners. If we should delete this entry, please send us a short E-Mail.